Ideal for cleaning areas that are prone to host pathogens, viruses, bacteria and fungi, Synbiont Ag Wash can be applied to the animal itself, facilities, stalls, kennels, bridles, bits, water buckets, feeders and places where animals frequent. It is the new, safe alternative to bleach and water. Used by commercial facilities, veterinarians and professional trainers, Synbiont Ag Wash has become the preferred alternative to harmful chemicals for advancing biosecurity efforts against viruses such as EHV-1 and protecting the well-being of animals. 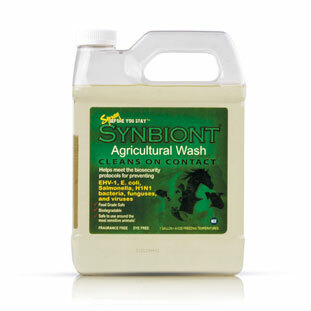 Visit www.synbiontagwash.com to learn more.